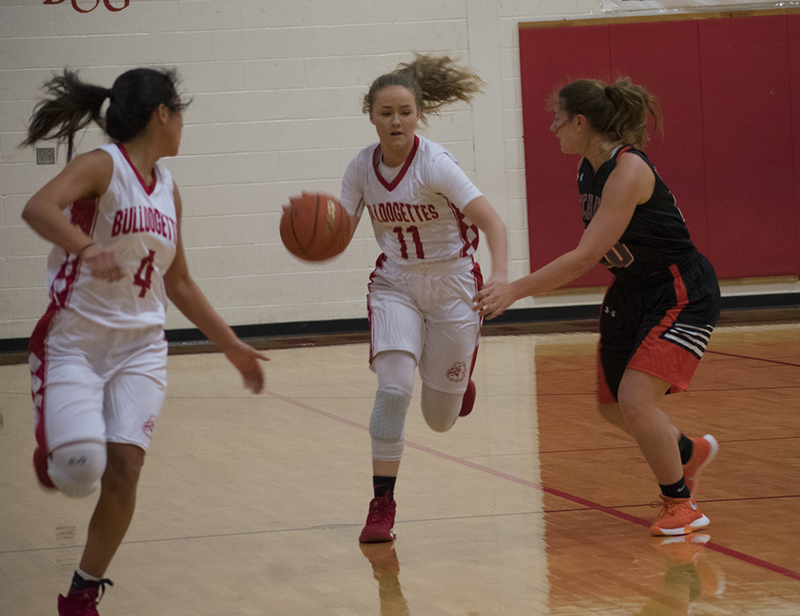 The Bulldogettes raked in a whopping 21 points in the first quarter and added 35 more over the course of the match for a decisive 56-27 win against the McCamey Lady Badgers Saturday in their first home game of the year. Coahoma’s performance on the court was a major improvement over last Tuesday’s loss against the Andrews Lady Mustangs said head coach Jim Kinnear. Although for a brief time in the fourth quarter the team lost discipline, they quickly regained focus, Kinnear added. “They (McCamey) were kind of playing sloppy and that made us play sloppy, but I called that time out, and we gathered our composure, and it was good,” he said. Caitlyn Corley led the Bulldogettes on offense with a team-high of 15 points for the game followed by teammate MaKynlee Overton with 11. It was Overton who jump started the Bulldogettes into action by sinking the ball in the net after the first minute and 15 seconds of play. Following her lead, teammate Cassie Grant buried her shot from behind the arc and less than 40 seconds later added another 3-point basket to her game stats. Paige Atkins piled on 5 points to the Bulldogettes score included a 3-pointer at the 3:35 mark. After that, Kenzi Canales sank her first of five baskets of the day when she grabbed a ball batted back into play by teammate Abby Lopez, who prevented a Bulldogette turnover. Jovi Gonzales wrapped up the first quarter for Coahoma by nailing a basket as the Bulldogettes heading to the second up 21-7. Both teams settled into defensive mode for the next round. McCamey netted 4 more points and Coahoma added 9 thanks to baskets by Overton, Corley, Canales, and Ashley Romero. In all, the Bulldogettes headed to the locker rooms with a comfortable 30-11 halftime lead. Once the mid-game break was over, both teams were back on the floor ready to play. The McCamey squad had its best quarter of play in the third netting 12 points, however, the Bulldogettes were far from content in their lead. Corley and Overton were dominating at the post. Combined, the two brought in 15 of 17 points for Coahoma. Overton nailed two baskets and one free throw while Corley netted four field goals including one from behind the arc. She also added more one point to the scoreboard earned at the charity strip. Like the second quarter, the game settled down for the fourth. Coahoma added another 9 points thanks to Corley, Canales, and Romero and held the Lady Badgers to 4 before the final buzzer sounded. With a long season ahead of them, the Bulldogettes (1-1) are focusing on refining their skills to prepare for a tough district season, Kinnear said. Next: Coahoma hosts the Post Lady Antelopes at the CES competition gym Tuesday. Game time is 5 p.m. for the JV and 6 p.m. for varsity. Coahoma: Caitlyn Corley, 15; MaKynlee Overton, 11; Kenzi Canales, 9; Cassie Grant, 8; Paige Atkins, 7; Ashley Romero, 4; Jovi Gonzales, 2. Free Throws: Coahoma, 5-11; McCamey, 10-23.